There are many decisions to make when it comes to your kitchen remodeling project, and choosing your new countertops is an important one. There are many things to consider before your contractor installs your new counters, such as your budget, the look you want to achieve and the work you’re willing to put into maintenance. Here are four countertop materials to consider along with the major pros and cons to each. The most popular type of natural stone used for countertops continues to be granite, which is available in a wide range of colors. It’s recommended that daily cleanups are handled with a stone cleaner rather than a multi-purpose one. While widespread use and availability have lowered the price of natural stone, this choice will often still be on the pricier end of the options listed here. 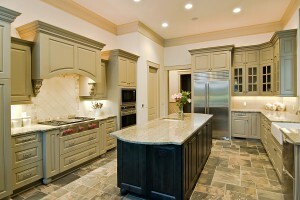 Engineered solid surfaces are an excellent kitchen remodeling choice for their durability. They stand up well to stains and scratches and are repairable in most instances. With an endless variety of colors and designs, you’ll have no trouble finding one that vibes well with your kitchen look. Little maintenance is required for the upkeep of solid surfaces, and pricing can be similar to that of granite. Butcher block countertops allow for dicing and chopping right on the material’s surface, and there’s no need to worry about damage from hot pots and pans. Wood is a softer material, so scratches and other marks are to be expected. That well-loved and worn look can certainly add charm to a kitchen, but if you prefer a cleaner look, wood may not be the best choice for you. If it’s been a while since you’ve taken a look at laminate countertops, you may be pleasantly surprised by your options. One of the biggest pluses of laminate is the prices are economical, however, they cannot handle high heat and can suffer damage from hot cookware. As you can see, there are a number of countertop options available to transform your kitchen. Consult with your kitchen remodeling professional for help in making the best surface decision to fit both your space and needs.